What is Azure SAP Archiving? Like never before, you can reduce your SAP footprint, cut costs, gain smarter utilization of IT resources and ensure leaner systems, while boosting SAP archive usage from a powerful yet simple interface that your line of business users will simply enjoy from day one. It’s time to cut the cost of primary storage and the complexity of your SAP data archiving by moving it to an enterprise grade Information Governance, Archiving and Records Management solution leveraging the highly flexible and compliant archive storage environment of Microsoft Azure. Reduce SAP footprint and unleash the full power of your mission critical SAP based business processes by archiving SAP content on a scalable, compliant and enterprise-proven information governance solution running on Azure. It’s easier than ever to expand you reach over vast quantities of data at a global level for the next level of customer engagement, employee productivity and business operations while archiving data and the corresponding SAP systems in an a audit-proof, always-on environment and achieve up to 75% cost savings. 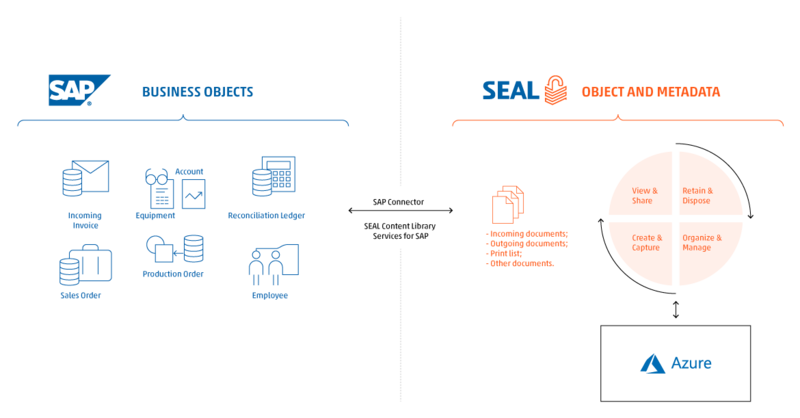 Enable non-SAP users to access, view and share documents directly from SEAL user interface for improved user experience. Powerful and flexible security rules to help you give access to as many employees as needed. Affordable licenses, fast implementation and lower maintenance costs.